Today, we have more health apps, exercise gadgets, computerised movement machines and wellness technology for every man, woman and child than at any time in human history. Instantaneously, we can know everything from how many steps we have taken, to how many kilojoules we have burned, to how we slept, to our resting and exercise heart rates. We have a pill or supplement for everything, whether it be to improve our health before we were born, to increasing our libido, improving sleep, building muscle, lowering stress, you name it. We have more gyms, health clubs, personal trainers, exercise physiologists, boot camps, pilates studios, dance studios, gym studios, spin clubs, sporting clubs than ever. Take note as you drive or walk around any suburb and you will find a plethora of health-care places. Anyone would think that we are the sickest, most in pain, most dysfunctional generation of people, ever. And if you don’t care now, you will when your healthcare and life / income protection insurance premiums, as well as your taxes (Medicare rebate) go through the roof in an attempt to cover the explosion in healthcare costs that is happening and likely to increase in the future. Possibly the two greatest untrue myths of this crisis are our quick fix mentality and our blinkered, isolationist approach to healthcare. Let’s face it, modern sports medicine would have you believe that to get better you need to get a scan, have surgery and voila, you will be better. Often, we are left with the impression that tissues and structures have magically healed. And it leads to the logical conclusion that we should also expect the same miraculous cure if we get injured. Very rarely however, is there any mention of the extent of the injury, the amount of treatment (often many times each day), ongoing injections and pain medication that an athlete may be taking as well as what the long term effects of the injury might be. Implied in this myth is that pain is the enemy. Pain medications, injections and even surgery tend to give the sense that pain must be avoided at all costs. And yet, legitimate pain is an essential aspect of healing. Why? Because legitimate pain, or pain that is logical, reasonable and purposeful, changes behaviour, in a positive way that facilitates healing. In fact, there is no more potent changer of behaviour than pain. Legitimate pain is like the warning lights on your car dash-board. Like these warning lights, legitimate pain indicates that something may be wrong. With your car you know that if you keep driving you risk doing major damage to your car. However, unlike our car warning lights, when we experience pain, we often try to ignore or repress it so that we can keep going, putting us at risk of further injury. And then, we wonder why our injury hasn’t healed and / or has worsened. It just doesn’t make sense. Understand that the longer that you have had your problem and the more severe that it is, then generally the longer that it may take to get better. Hence, it is probably unrealistic to expect that if you have had your pain for longer than 3 weeks or longer, that it going to be better in one or two sessions. The reason is that not only has your injury not healed, but your body, brain (neural pathways) and even the way that you live, have already begun to adapt to your injury. In addition, treatment needs to be intense enough to create and reinforce a positive change. Even if you are seen for one hour a week, there are 167 other hours where the pressures of life can so easily undo all the benefits of your treatment. This is especially true in the first couple of weeks where healing may be more “fragile” and hypersensitive to stress. Consequently, treatment initially must be more intense to protect you from re-injury and then taper as you experience a progressively longer lasting result. To achieve any result however, your active participation in your recovery is absolutely vital. Without it, it is likely that your recovery will either be delayed or impeded. If you need to use pain or other medication to control inflammation or to enable you to cope and function, then please do so under the guidance of your doctor. Know that this medication is not the end result, but a means to an end in your journey to be pain and limitation free. The other untrue myth relates to our blinkered, isolationist approach to healthcare. Becoming a specialist enables a health care professional to charge a lot more money. It also gives the impression that a health professional who has “specialised” in an area of the body, must be good at what they do. After-all they are a specialist. They must know more detail about the area of the body that they have studied than a generalist who just knows a little of everything. In fact, it is possible that every mechanical pain felt in one part of your body might be caused by a seemingly unrelated tissue or structure in another part of your body. And the danger is that a specialist health professional, knowing just one area of your body well, doesn’t consider incorrect function in other areas of the body or even in the way that you live that may have led to the pain. Over the last ten years or so, there has been a revolution in our understanding of the brain’s involvement in the experience and perpetuation of pain. Whilst once the brain was thought of as a receiver of pain, now it is known that after some time the brain may become a transmitter and perhaps even a magnifier of pain. Consequently, a major thrust of treatment has focused on normalising your experience of pain by accepting and embracing legitimate physical and psychological pain as a necessary aspect of healing and recovery. Now, it is understood, that it is not your muscles, nor your nerves, nor your joints, nor any one tissue or structure that may be at fault. It may actually be all of these tissues and structures and more that may be contributing to your pain or problem based upon how you move and live. Preventing and recovering from physical injury isn’t necessarily difficult, but it does take work, discipline and even sacrifice. Every-day, I see classic examples of the falseness of these two myths. For example, just yesterday, Sue presented complaining of left and right foot big toe pain. She informed me that a couple of years ago she had bunions and neuromas (swollen, inflamed nerves) removed from the inside of her big toe. When I looked at her feet and the way that she walked, immediately I could see her problem. Despite having her bunions removed and been given orthotics, Sue’s “bunions” were returning. In addition, her big toes were pushing inwards, squashing all of her other toes. Sue walked with her feet turned out and wide apart. The two possible reasons for this are lack of balance and poor hip strength, which were then confirmed on testing. Not only is walking with your feet wide apart inefficient and tiring, it means that Sue’s body weight is falling inwards. As a consequence, Sue’s thighs tended to roll inwards causing flattening of her feet (pronation) and leading her to push off the inside of her big toes with every single step. Walking like this then leads to foot pain, ankle stiffness, calf and outside thigh tightness, weakness of her quadriceps and buttock muscles, instability of her core and osteoarthritis of her feet, ankles, knee, hips, back and even her neck. No wonder Sue was in pain! Fixing Sue’s problem is not hard, but it does take work. It involves, freeing up her hips and ankles, increasing her core, hip and thigh strength, improving her standing balance and correcting the way that she walks. Orthotics would also be helpful in accelerating and sustaining her progress. The bottom line is deal with your pain, actively. Address the sources and the causes of your pain. Be pro-active and disciplined in following through with a specific treatment strategy that will deliver you the result that you want. With your therapist, develop a strategic treatment plan complete with aims, actions, milestones and a timeline. Then monitor your progress. Celebrate your improvement and make adjustments where necessary to ensure that you stay on track. The modern world has duped us all into believing that injury prevention and recovery involves some magical pill or miracle technique. It is so appealing because it doesn’t take effort, costs little and is highly convenient. But these are false myths. Injuries do not occur for no apparent reason and they do not tend to occur in isolation. Your aches and pains, as well as any other signs or symptoms such as swelling, clicking, tightness, grating, is your body’s way of telling you that something may not be quite right. Don’t dismiss these warning signs. Learn about them, understand them and address them quickly and comprehensively. This is the best way for you to achieve the best, fastest result possible. The real question is, “Are you willing to do the work?” no matter how inconvenient, uncomfortable or time consuming it might be. Because if you are not, then just be aware that you may be wasting your money, time and your life with costly, temporary, band-aide solutions, that may in fact lead to a worsen of your problems. In the end, it may cost you and all of us a lot more than just dealing with the causes of your problem in the first place. If you have any questions or would like advice on any signs or symptoms that you might be experiencing, please call Bodywise Health on 1 300 BODYWISE (263 994). I wish you the best of health and life. It has been said that “Treatment without diagnosis is malpractice”. And it is true that in todays’ practice of modern healthcare, diagnosis provides the over-riding foundation which directs both the type, amount and sequencing of treatment interventions. Our obsession with diagnosis is evidenced by the explosion of diagnostic tests that are performed every year. However, not only can the increase in CT and X-ray scans pose a health risk, they can be misleading. Consequently the surge in CT and MRI scans has failed to boost diagnostic rates. And yet, even if CT, MRI and ultrasound scans did increase the accuracy of your diagnosis, this may not be enough to improve treatment outcomes. The reason is because while x-rays and scans might tell you what the source of your problem, they do not tell you the cause. In other words, they give you the what, but not the why. And although it is important to know which structure or tissue is the origin of your pain or problem, it is perhaps more important to know why. Because unless the cause of your ailment is corrected, your problem will always return even if you replace the injured body part. I spoke about this phenomenon in my blog The Surprising Cause of Pain. In modern healthcare, we strive to name your diagnosis. That by putting a label on your condition, we can somehow better encapsulate, understand and manage your ailment. However, in so doing, we risk becoming blinkered to other possible sources, causes and implications of your injury. Being given a diagnosis often gives the impression that it is just one tissue, one structure or one body part that is at fault, when in reality, it is often many tissues, structures and body parts that contribute to the cause of your physical problem. A case in point is osteoarthritis. Osteoarthritis refers to inflammation and the subsequent breakdown of the surface covering of the bone ends at joints. What perhaps is not so well known is that along with this, the underlying bone begins to breakdown. Bony projections (called osteophytes) form at the joint margins. The membrane lining the inner part of the joint (synovial membrane) becomes inflamed and swollen causing excessive fluid to be secreted. Joints become red and swollen. The capsule and ligaments that hold joints together may become lax. Muscles either spasm or become flaccid causing muscle imbalance and joint mal-alignment. Nerves become hypersensitive and restricted. Connective tissue (fascia) becomes taut and fibrotic. Blood flow may be compromised. The surrounding environment may become acidic. Even your brain can become stressed, sensitized, reactive and magnifier of your pain. And so the cycle of chronic pain begins and is perpetuated. And this is not even to mention the incorrect motion in other parts of the body which may have led to the abnormal or excessive forces that caused the osteoarthritis in the first place. The same goes for any injury whether it be a muscle strain, a joint sprain, disc injury, tendinopathy, bursitis or other condition. I had a classic case of this a couple of weeks ago. Ann was suffering with intense inside right knee pain that came on “for no apparent reason” a couple of weeks before. So painful was Ann’s knee that I had to see her at home because she was unable to put weight on her right leg to walk. Ann reported that she had had an MRI which revealed a burst Baker’s cyst (fluid filled sack behind the knee). This finding didn’t match Ann’s knee pain as a burst cyst would generally lead to pain, tightness and swelling behind the knee and Ann’s pain was on the inside just below the knee joint. On examination, Ann’s right knee was indeed red, swollen and exquisitely tender on the inside of the knee just below the joint line. This corresponded to a different inflamed bursa (fluid filled sack called the Pes Anserine Bursa). After applying cold packs and teaching Ann how to use crutches so that she didn’t weight bear on her right leg, Ann left to have another MRI for confirmation. This MRI revealed that she had a torn inside cartilage and this was the diagnosis that was given to Ann as a cause of her pain. So Ann then underwent an arthroscope to “repair” this inside cartilage. To my surprise however, Ann returned to me two weeks later. Despite having an arthroscope, Ann’s pain hadn’t changed. In effect, the arthroscope may have corrected a condition, but this condition wasn’t the source of Ann’s pain. On retrospect, I shouldn’t have been surprised, as again the MRI didn’t match Ann’s signs and symptoms; that of redness, swelling and intense pain just below the joint line on the inside of Ann’s knee over the area of this bursa. Furthermore, on close questioning, it became clear that Ann’s knee pain was being caused by the way that she was sitting. So Ann was put on intense program to treat the inflamed joint tissues (synovium), fascia (connective tissue) nerves, muscles and bone surfaces. Ann was also shown how to sit and walk without aggravating her knee. Two weeks later Ann left for overseas with minimal pain. For the best, fastest, most complete recovery, it is essential that all the implications, complications and contributions to your ailment are adequately addressed, treated and resolved. This is referred to as the Bio-Psycho-Social Model of Healthcare. It refers to the fact that the best outcomes will be achieved only when all the Biological, Psychological and Social factors have been taken into account and solved. For optimal healing and recovery you must treat the muscle, the joint, the connective tissue and the nervous system. You must correct the biomechanics, posture and movement patterns. You must optimise the psychological and social environment to enhance recovery. Yes, a diagnosis is important. But even more important is that the “diagnosis” given from an investigation such as an x-ray or scan is confirmed by a comprehensive assessment and professional clinical examination. It is then critical, that all the information gained is used to devise a treatment strategy or Recovery Action Plan that treats and corrects both the source and cause of your problem. This is the only way to achieve the best, fastest, most complete recovery possible. If you would like any help with any aspect of Getting Better, Staying Better and Living Better, please don’t hesitate to call us here at Bodywise Health on 1 300 BODYWISE (263 994). We would love to help you get back to living freely and without pain. · For complex or chronic conditions, you may qualify for the EPC (Enhanced Primary Care Program) allowing you to receive 5 allied health services each calendar year with a referral from your GP. For more information, please call Bodywise Health now on 1 300 BODYWISE (263 994). If you suffer from Osteoarthritis or Rheumatoid Arthritis, recent research offers you new hope. New research published in the Journal Pain Practice, August 2017 indicates that it is inflammation and especially neuro-inflammation (inflammation of the nerves) rather than degeneration that is the cause of arthritis, especially osteoarthritis. Inflammation is an immune response critical for healing. During this process, white blood cells are activated to break down and ingest damaged cells, thereby clearing the area for the laying down of new tissue. The problem is that constant, long term irritation (greater than 6 weeks) from external forces (e.g. excessive physical loading) and internal forces (e.g. chemical / nutritional and psychological / stress / depression) can cause over-stimulation of your immune system so that it begins to breakdown undamaged or healing tissue, thereby impeding healing. Nerves are like the communication and power lines in our body. They serve to give feedback to the brain (and spinal cord) as to what is happening from both inside and outside the body and then they provide the conduit for impulses to the body’s tissues (e.g. muscles) so that the body can respond. Like power lines, they need to be able to mobile and to move as your body moves so that they don’t get tugged, caught or pressed on. If they do, then the result will be adverse reactions such as pain, pins and needles, numbness and even loss of power. Nerves in particular can have a magnifying effect on the pain experienced with inflammation. Not only do they become over-sensitive to stimuli, they also become restricted in their mobility. This leads to nerve tension, irritability, soft tissue tension (e.g. connective tissue, muscle), joint restriction and stiffness and faulty postures and movement patterns, further perpetuating the problem. Not only that, but your brain which initially acts as a receiver of pain then after about six weeks can become a transmitter of pain beginning and perpetuating the cycle of chronic pain. However, what this new research means for you is that if you can reduce the inflammatory process, you may be able to limit and perhaps even turn around this destructive process. Avoid or at least change the way that you perform these behaviours so that they become non painful. Unload the structure which is hurting with tape, bracing, sling, crutches etc. to the point that stress has been alleviated. Apply a cold pack for 10-20 minutes (check the skin every 5 minutes for adverse skin reactions) and repeat at least 6 times a day for 3- 5 days. The emphasis on cold packs is especially important towards the end of the day. Depending on the severity and the irritability of the tissue (how much stimulus causing how much pain for how long it lasts), dictates how much movements is possible. The key is to keep movement pain-free, easy and not stressful for at least 1-2 weeks to remove inflammatory chemicals and aid healing. Specific neural mobility techniques and exercises may have a profound effect on increasing nerve mobility and reducing nerve irritability and inflammation. Eat complex carbohydrates and low GI foods. Reduce you intake of simple, refined carbohydrates such as anything with white flour and white sugar. Refined carbohydrates cause the hormone insulin to spike which causes inflammation. Avoid trans-fats that contain hydrogenated oils such as many fried foods, pastries, cakes, biscuits and margarine. These are inflammatory. Reduce the intake of your food which creates an acidic environment inside your body by reducing your intake of sugar, red meat and animal products, alcohol, coffee, soft drinks) and increasing your intake of vegetables (especially green) and filtered water (2 litres per day). Avoid any food which gives an inflammatory or allergic reaction. How do you know? Listen to your body. Any time you feel lethargic, irritated, “foggy”, tired or sleepy after a meal? Do your nails tongue, hair, teeth, eyes, skin, lips, mouth, muscles and stools have any adverse changes? Eat high quality protein (>0.8 gms/kg per day). To reduce inflammation and improve healing take a daily pro-biotic and fish oil 6-9 gms/day, 1 ½ teaspoons or 8 capsules or 1 quality krill oil capsule. For natural pain relief take quercetin 600-1000mg/day Rutin, Bromelin, Curcumin. Better manage stress so that you have a sense of control, of being in the moment, are sleeping well and are well connected with other people. It is beyond the scope of this blog to go into detail with management strategies. Suffice to say that if you are feeling stressed, out of control, not coping and or things are affecting adversely your everyday life then seek help from your GP or a qualified psychotherapist. Whilst arthritis can be painful and debilitating, this new research offers you hope. In particular, the concept of reducing nerve inflammation through nerve mobility techniques may provide a powerful treatment to restoring joint health. If you are having or have had treatment for arthritis, ask your health professional to assess and treat your nerve mobility. It may just be the key to getting you better. 1. Avoid or at least change the way that you perform these behaviours so that they become non painful. 2. Unload the structure which is hurting with tape, bracing, sling, crutches etc. to the point that stress has been alleviated. 3. Apply a cold pack for 10-20 minutes (check the skin every 5 minutes for adverse skin reactions) and repeat at least 6 times a day for 3- 5 days. The emphasis on cold packs is especially important towards the end of the day. 4. Depending on the severity and the irritability of the tissue (how much stimulus causing how much pain for how long it lasts), dictates how much movements is possible. The key is to keep movement pain-free, easy and not stressful for at least 1-2 weeks to remove inflammatory chemicals and aid healing. 5. Specific neural mobility techniques and exercises may have a profound effect on increasing nerve mobility and reducing nerve irritability and inflammation. 1. Eat complex carbohydrates and low GI foods. Reduce you intake of simple, refined carbohydrates such as anything with white flour and white sugar. Refined carbohydrates cause the hormone insulin to spike which causes inflammation. 3. Avoid trans-fats that contain hydrogenated oils such as many fried foods, pastries, cakes, biscuits and margarine. These are inflammatory. 4. Reduce the intake of your food which creates an acidic environment inside your body by reducing your intake of sugar, red meat and animal products, alcohol, coffee, soft drinks) and increasing your intake of vegetables (especially green) and filtered water (2 litres per day). 5. Avoid any food which gives an inflammatory or allergic reaction. How do you know? Listen to your body. Any time you feel lethargic, irritated, “foggy”, tired or sleepy after a meal? Do your nails tongue, hair, teeth, eyes, skin, lips, mouth, muscles and stools have any adverse changes? 6. Eat high quality protein (>0.8 gms/kg per day). 7. To reduce inflammation and improve healing take a daily pro-biotic and fish oil 6-9 gms/day, 1 ½ teaspoons or 8 capsules or 1 quality krill oil capsule. 8. For natural pain relief take quercetin 600-1000mg/day Rutin, Bromelin, Curcumin. Overcoming arthritic knee pain and achieving knee pain relief is one of the greatest orthopaedic treatment challenges there is. Knee arthritis is the most commonly diagnosed cause of knee pain in people over 50 and achieving knee pain relief from knee arthritis is the main reason why people seek a knee replacement (Losina et al 2012, Nguyen et al 2011). In 2010, 25,970 total knee replacements were performed in Australia, representing a 67% increase over the past seven years and a direct cost to the health system of $2.24 billion (consisting of $900 million in hospitalisation, $8.5 million on GP visits, $2.2 million on specialist visits and $1.4 million on other practitioners). Despite this, 15-30% of patients report no or little functional improvement in the 12 months following a knee replacement and those people who have a knee replacement too early, report dissatisfaction with their knee replacements (Paulsen 2011). Pain from knee osteoarthritis can range from barely perceptible to unbearable. This is especially confusing when the amount off pain reported does not correlate with the severity of change found on X-ray (Cubukou et al 2012, Schiphof et al 2013). 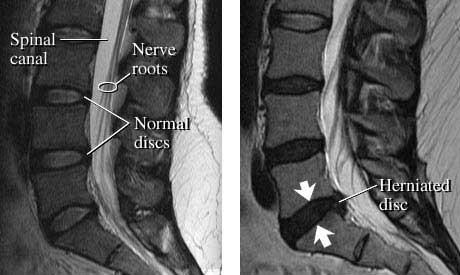 Likewise, most people over the age of 50 have structural abnormalities consistent with osteoarthritis on MRI but only one third have pain. 5. the fat pad (which sits just under the bottom part of the knee cap). There is bad news and good news if an MRI shows that you have a horizontal cleavage meniscal tear in your knee. The bad news is that you have torn the cartilage where it has a nerve supply and this can cause immense pain and discomfort especially while sleeping. The good news is that where there is a nerve supply, there is a blood supply which means that if the appropriate conservative treatment is given, the tear can heal, albeit slowly (it can take up to 12 months). If you decide to have an arthroscope (partial meniscectomy), research has shown that recovery takes the same length of time, but your knee will become a lot more arthritic, a lot more quickly compared to if you just stick with physiotherapy (Sihvonen et al 2013, Katz et al 2013). Osteoarthritic knee pain increases as your weight increases and as your quadriceps muscle strength decreases (Nguyen et al 2011, Amin et. all 2009, Segal et al 2010. Therefore, the two most important changes that you can make to achieve arthritic knee pain relief is to reduce your weight and increase the strength of your quadriceps muscle. Research has shown that it is not only knee pain but the fear of pain that can reduce your quadriceps muscle strength (Hodges et al 2009). Furthermore, middle aged people who have decreased quadriceps strength report increased knee pain and MRI scans show accelerated osteoarthritic changes in the knee (Wang et al 2012). Incorrect knee joint alignment, poor quadriceps muscle control, faulty movement and excessive loading all lead to excessive or abnormal forces being placed upon the structures and tissues of the knee. This can lead to pain which further inhibits your quadriceps muscle strength thereby perpetuating and accelerating your knee degeneration. (Hayashi et al 2012, McConnell and Read 2014). Optimising your everyday postures and movements (e.g. walking) so that the most ideal forces possible are placed on your knee joint. Inflammation is a breaking down process. It must therefore be limited for healing to take place. If you experience constant, throbbing pain and your knee feels warm apply cold packs (wrapped in a damp thin cloth) to your knee for 15 minutes at least 6 times a day (be sure to check your skin every 5 minutes for adverse reactions). Do this until the warmth, constant pain, night pain and morning stiffness in your knee recede. Or if your knee pain is worse at the end of the day, apply a cold pack 3 or 4 times on the hour before you go to bed. This will help you sleep better and awake in the morning with less knee stiffness. Walking with elbow crutches for up to 2 weeks to enable reduce inflammation to recede and facilitate healing and repair. To accelerate healing and optimise your knee's repair, employ "hands on" freeing up techniques, Bodyflow therapy (which improves circulation), Lipus Ultrasound (which stimulates the laying down of tissue), heat therapy (which increases activity) and easy pain-free movement, all of which have been proven to assist with healing. Your knee cap and knee joint alignment can be corrected by using "hands on" techniques to free up stiff joints and loosen tight soft tissues, applying tape or bracing to hold joints in correct alignment and then through targeted exercises that strengthen weak muscles and stretch tight, stiff soft tissues. Rehabilitation programs which improve the stability and strength of your core, hip and knee and which optimise the way that you move, have been shown to reduce knee pain for up to 12 months following physiotherapy. These programs have also been shown to improve the quadriceps muscle tone as well as the position of the knee cap on MRI scans (McConnell and Read 2014) indicating an increase in quadriceps muscle strength and therefore an improved dynamic stability of the knee. Improving your balance and increasing your core, hip and knee muscle strength can ultimately lead to an improvement in everyday activities such as standing, rising from sitting, getting in and out of cars and walking. And by "normalising" the forces on your knee during your everyday activities, the abnormal or excessive forces that cause the break down and irritation of the knee joint tissues and structures are eliminated. Ultimately, these rehabilitation programs may help you avoid the need for a knee replacement or at the very least help improve your muscle function, mobility and quality of life thereby delaying your need for a knee replacement. They will also give you the best chance of an optimal outcome if you do have to have a knee replacement. The evidence is clear. Specific physiotherapy treatment is a proven, safe, effective and lower cost alternative in helping you to attain knee pain relief from arthritis. So if you do suffer from arthritic knee pain and you want the best, safest, most empowering way of overcoming your knee pain, you should consider a physiotherapy treatment program as your first option. We might just be able to save our government's bottom line and you a lot of time and heartache. If you have physical pain and would like a solution to your problem, please call 1 300 BODYWISE (263 994) for your FREE assessment and advice. Until next time, Stay Bodywise. 6. Schiphof D, Kerkhof HJ, Damen J, de Klerk BM, Hofman A, Koes BW, van Meurs JB, Bierma-Zeinstra SM Factors for pain in patients with different grades of knee osteoarthritis. Arthritis Care Res 2013;65(5):695-702. 7. Guermazi A, Niu J, Hayashi D, Roemer FW, Englund M, Neogi T, Aliabadi P, McLennan CE, Felson DT. 2012 Prevalence of abnormalities in knees detected by MRI in adults without knee osteoarthritis: population based observational study (Framingham Osteoarthritis Study). BMJ. 29;345:e5339. 8. Javaid MK, Lynch JA, Tolstykh I, Guermazi A, Roemer F, Aliabadi P, McCulloch C, Curtis J, Felson D, Lane NE, Torner J, Nevitt M. 2010 Pre-radiographic MRI findings are associated with onset of knee symptoms: the most study. Osteoarthritis Cartilage;18(3):323-8. 9. Felson DT, Parkes MJ, Marjanovic EJ, Callaghan M, Gait A, Cootes T, Lunt M, Oldham J, Hutchinson CE. Bone marrow lesions in knee osteoarthritis change in 6-12 weeks. Osteoarthritis Cartilage. 2012;20(12):1514-8. 11. Katz JN, Brophy RH, Chaisson CE, de Chaves L, Cole BJ, Dahm DL et al. Surgery versus physical therapy for a meniscal tear and osteoarthritis. N Engl J Med. 2013;368(18):1675-84. 13. Clements KM, Ball AD, Jones HB, Brinckmann S, Read SJ, Murray F. Cellular and histopathological changes in the infrapatellar fat pad in the monoiodoacetate model of osteoarthritis pain. Osteoarthritis Cartilage. 2009;17(6):805-12. 14. Amin S, Baker K, Niu J, Clancy M, Goggins J, Guermazi A, Grigoryan M, Hunter DJ, Felson DT: Quadriceps strength and the risk of cartilage loss and symptom progression in knee osteoarthritis. Arthritis Rheum 2009,60:189-198. 15. Segal NA, Glass NA, Torner J, Yang M, Felson DT, Sharma L, Nevitt M, Lewis CE: Quadriceps weakness predicts risk for knee joint space narrowing in women in the MOST cohort. Osteoarthritis Cartilage 2010,18:769-775. 17. Wang Y, Wluka AE, Berry PA, Siew T, Teichtahl AJ, Urquhart DM, Lloyd DG, Jones G, Cicuttini FM. Increase in vastus medialis cross-sectional area is associated with reduced pain, cartilage loss, and joint replacement risk in knee osteoarthritis. Arthritis Rheum. 2012;64(12):3917-25. Myth One - Eccentric exercise is the best exercise for rehabilitating tendon. Whilst eccentric exercise (strengthening exercise where the muscle is lengthening) is the most researched, evidenced based program that is used, world renowned tendon specialist Professor Jill Cook from Latrobe University states that upon reflection, eccentric exercise by itself is deficient because it doesn't address the specific requirements of a person. They may be OK for the middle aged male runner, but they aren't that great for the younger sprinter or for the older person. More importantly, eccentric exercise doesn't address the strength deficits of the muscle or of the body in general and they don't address the new research findings of the brain's and nervous system's deficiency in activating the muscle. Therefore, eccentric exercises by themselves are quite deficient in being able to restore full function. What is the best treatment program for tendon problems? The best treatment for tendon problems is really tailoring a program that best matches each person's individual wants, needs and requirements. For example, a young sprinting athlete with a hip tendon pain will have a different program to an older woman with the same condition. Likewise a shoulder tendon problem will have a different program to an elbow tendon or an Achilles tendon problem. And even further from this, an Achilles tendon problem where the pain is in the mid portion of the tendon, the same as if the pain is at the insertion (attachment) and you can't treat either the of these the same as if the problem is in the covering of the tendon (peritendon). This is why people need to be treated so individually. The purpose of treatment is to restore function to the level that a person wants. Anything after this is a bonus. What are the key principles in tendon treatment? 4. Correcting faulty functional movement patterns. What stages are involved in tendon rehabilitation? To restore people back to high level function is a four stage process. For a person who doesn't need to meet high level athletic demands, they will not need to go through all four stages. Stage 2 involves implementing a good strength program for the muscle/tendon unit as well as all other associated parts of your body. For example, the higher up your leg that you go, the more that you need to restore below the problem. If you have an Achilles problem, it is mainly calf that needs to be restored. If you have a knee tendon problem then the quadriceps and calf will also need to be restored. And finally, if you have a hip tendinopathy, it is glutes, quadriceps and calves that need to be restored. In particular, you need to restore the strength of your anti-gravity muscles and then depending on their activity level, you need to restore the spring. As the tendon act like springs, you need to make them work again especially with the faster the movements and energy storage movement. Stage 3 involves adding to this is endurance. For example, if someone wants to play football, they not only need to have a great general body strength and control and a great set of springs, they also need to spring repeatedly and therefore their tendons must have great endurance. It is this lack of endurance, or the capacity of the tendons to tolerate prolonged stress, that failure occurs. Stage 4 involves adding spring strength and endurance. This is why tendons often take so long to get better. They often present extremely debilitated and damaged. There often has been long term pain with the tendons being robbed of their energy, endurance and muscle strength and bulk. And all of this needs to be restored, before the tendon can be made resilient enough to cope with the stresses that a person want to place upon the tendon in the activities that they want to get back to. People who leave treatment early will often find that their pain will return in a couple of weeks because the tissue is only as good as the load that is placed upon it. And this is the same for tendon, muscle and bone. This means that if tissue hasn't been restored to a capacity that is needed in an activity or sport it will fail again. It's just physics. You cannot continue to load a tendon greater than what is has been trained to do. It isn't rocket science and just self-evident. Physiotherapy should the first treatment of choice because tendons need exercising and correct loading. Physiotherapy shouldn't come after medication, injections or other intervention. Tendon problems were originally thought to be an inflammation of the tendon (i.e. Tendinitis) in the 1970's until a fantastic study showed that tendon pain was primarily due to degeneration rather than inflammation. Of course, like any other tissue, there will be some inflammatory markers and there will be some inflammatory cells because it's a tissue that is injured. However, inflammation is not the driving process. It is not the thing which is creating the pain and it is not the thing which is creating the ongoing pathology. What causes the pathology is due to the over-loading of the tissue either on a prolonged or a short term basis. What causes the pain seems to be the tendon cell releasing pain chemicals. If a person has an acute injury and ice doesn't help, then don't waste your time putting ice on the injury. Spend your time doing exercise. If ice does help, this is an indication that the injury probably has some peritendon (sheath covering the tendon) involvement. Therefore, ice and anything else which you perceive to be helping can be used along with exercise that has the correct loading. The evidence however, is that rest, ice, compression and elevation won't help you. Myth Three - Once the tendon is pain free and you have returned to sport you don't need to do your exercises any more. It is important that you understand that even if your tendon is pain free and you have returned to sport that the pathology in the tendon is still there. Tendons don't heal even if the pain goes away. Once a tendon, always a tendon. If you do the right things your tendon will stay pain free. If you don't do the right things, your tendon will become painful again. In addition to this, your brain is still inhibiting the activation of your muscles, because it is worried that you are going to re-injure your tendon again. Consequently, this means that if you return to sport and you stop your strength training, your muscle strength will decrease markedly if you stop your exercises and you will be prone to re-injuring yourself. To prevent re-injury, it is important that you continue with your strength training exercises at least twice each week for at least a year following full recovery and then you may have a chance to give up the exercises. For elite athletes they need to continue with their strength exercises 3 times a week for the rest of their careers. This is because these strengthening exercises are acting like an insurance policy. If you can stay strong, you keep your tissue (muscle and tendon) capacity up, you will be less likely to get into trouble again. Because of your brain protective inhibition on your muscles and tissues, it means that when you have been injured, when you return to sport, you won't run, jump, twist, turn or just move quite the same way that you did before your injury. Therefore, the first season following a major injury is a building season. Following this you will need to do a really good pre-season and the second season back will be a "cracking" season. It can take this long to be able to use your tendon as a spring and be sure that it is not going to cause your pain. It is critically important that you are educated regarding your tendon pathology. You need to see how much swelling there is, how much muscle bulk you have lost, how your tendon store energy and how badly you hop. You need to understand how your tendons react to pathology and how pain is caused and how we need to build capacity. You need to understand that once a tendon, always a tendon and though you can become pain free and you will be able to return to sport, we want you to be able to play as well as you can. You might be a bit sore the day after sport, but you will be able to train the day after this. Understand that unless you are prepared to buy in to a 3 to 6 months rehabilitation process (and sometimes longer), there is no point in starting. You need to understand how long it will take and why, so that you can work with your tendon and your body to achieve the best outcome. Unfortunately there is no quick fix. If you have tendon problem and you want to get better as quickly as possible, call Bodywise Health on 1 300 Bodywise (263 994) for a no obligation, complimentary assessment and advice. You have nothing to lose except your pain! There have been two major knee injuries reported to have occurred during the season so far. Sophie Armitstead with a meniscal tear of the same knee she's previously had an ACL reconstructed and Kim Mickle who ruptured her ACL. But what is this 'ACL'? The Anterior Cruciate Ligament is a rope-like structure that supports your knee from the inside. In some ways, it is the last structure that prevents your thigh bone and leg bone separating during not only high force activities but also day to day activities, like walking down stairs. In addition to the structural support offered, it is also considered to give information to the brain about how you are moving from the stretch and pull it undergoes as you move. Ideally, the joint and ligament is protected by strong muscles around the joint that can absorb most the force. What puts the ACL at risk? Somethings are out of our control, like the weather. There have been some weather conditions, that lead to a dry field, that have been seen to increase the risk of an ACL injury1. Regrettably being older or having a previous knee injury also increases the risk of an ACL injury. A higher grade of football was noted to contribute to an increased risk, but these players were also generally older and had previous injuries. Gender is also a very interesting element of ACL risk. It has been found that females have an increased risk of ACL ruptures in several sports. These sports include wrestling (4 times the risk, compared to males), basketball (over 3 times the risk, compared to males), soccer (around 2.5 times the risk, compared to males), rugby (nearly 2 times the risk, compared to males) and lacrosse (only slightly higher risk)2. That study was done before the Women's AFL took off, so it did not include females playing AFL as a comparison. It was also interesting to see that AFL had similar ACL injury rates to soccer and basketball. Fortunately, there are somethings that we can do to help reduce the risk. Increased weight and the associated higher Body Mass Index (BMI) have also been reported as putting the ACL at more risk of a rupture1. So, eating healthy and maintaining a good balance of regular physical activity has yet another advantage! Most ACL injuries in AFL matches occur without contact. This would suggest that there are elements that could be worked on to reduce the risk of an ACL rupture. Fortunately, research has backed this up3. Specific movement strategies and muscle groups have been identified as areas that players can work on to effectively reduce their risk of rupturing their ACL3. If you are an AFL player or play one of the sports mentioned above, it would be worthwhile booking an appointment with a Bodywise Health Physiotherapist to assess your strength and movement patterns. This allows the physiotherapist to prescribe an individualised exercise program aimed at reducing your risk of an ACL rupture and the expensive surgery and rehabilitation that goes along with it. For further information on how you can prevent knee injuries or for a FREE assessment, please call 1 300 BODYWISE (263 994). Orchard, John et al. "Intrinsic And Extrinsic Risk Factors For Anterior Cruciate Ligament Injury In Australian Footballers". The American Journal of Sports Medicine 29.2 (2001): 196-200. Web. 3 Mar. 2017. Prodromos, Chadwick C. et al. "A Meta-Analysis Of The Incidence Of Anterior Cruciate Ligament Tears As A Function Of Gender, Sport, And A Knee Injury-Reduction Regimen". Arthroscopy: The Journal of Arthroscopic & Related Surgery 23.12 (2007): 1320-1325.e6. Web. Cochrane, Jodie L. et al. "Characteristics Of Anterior Cruciate Ligament Injuries In Australian Football". Journal of Science and Medicine in Sport 10.2 (2007): 96-104. Web.